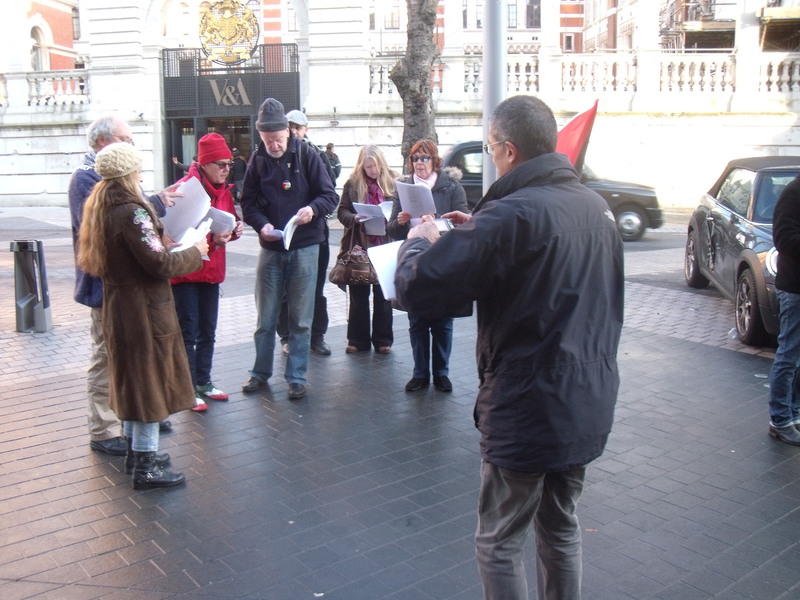 From the Warsaw Ghetto to John Lewis for Palestine Solidarity Campaign’s Ewa Jaciewicz. 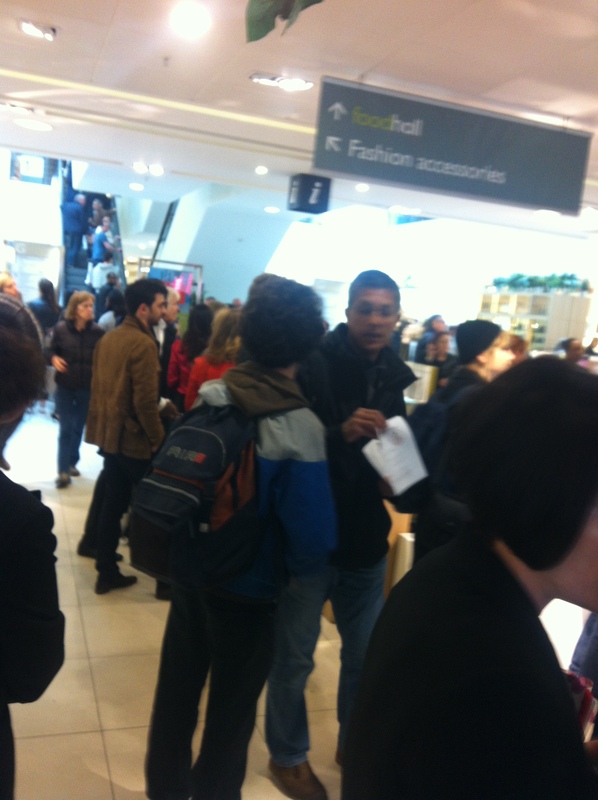 PSC’s Salim Alam handing out anti-Israel leaflets inside John Lewis. Ewa Jaciewicz is an activist. That’s what she does. She was last seen hanging around inside a chimney in Nottingham for which she was “rigorously trained”. She writes about her activism in great detail for The Guardian. On Saturday she helped orchestrate an anti-Israel protest inside John Lewis on London’s Oxford Street. About 50 anti-Israel activists followed her in and unfurled banners accusing Israel of apartheid and urging shoppers not to shop in John Lewis because it sells products made by Sodastream, an Israeli company with a factory on the West Bank that produces items enabling consumers to live greener lives. Jaciewicz, a campaigner against climate change, should be sympathetic to Sodastream except her desire to see the Jewish state disappear obviously trumps all the good that Israeli companies do for the world. Now, that’s hypocrisy for you. Meanwhile, you can buy Sodastream products online from John Lewis here. There is nothing illegal about Sodastream, and international law fully supports Israel’s presence in the West Bank. Anyone would have a very hard time disproving this. But what Jaciewicz, a member of the Polish Campaign of Solidarity with Palestine, never wrote about for The Guardian was her trip a few years ago to the Warsaw Ghetto. Now, what would a reasonable human being do if they visited a site where some 400,000 Jewish people (or people of any religion for that matter) lost their lives? Say a prayer, lay a flower, place a simple stone in remembrance? 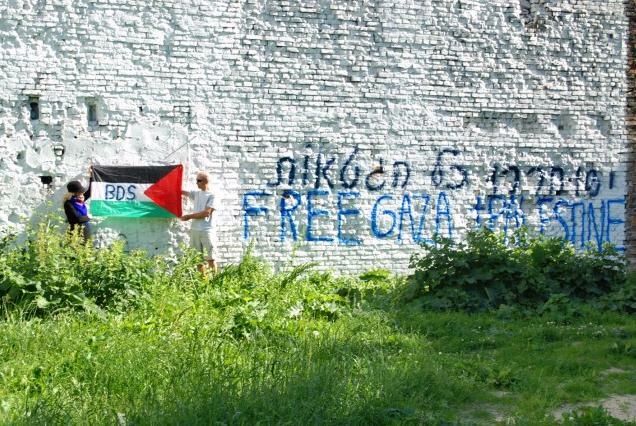 Jaciewicz helped daub the words “Free Gaza and Palestine” on one of the nearby walls. What did any of those 400,000 innocent lost souls ever do to her? Jaciewicz on the left near Warsaw Ghetto. One of Jaciewicz’s accomplices inside John Lewis was Salim Alam, one of the head honchos at the Palestine Solidarity Campaign. 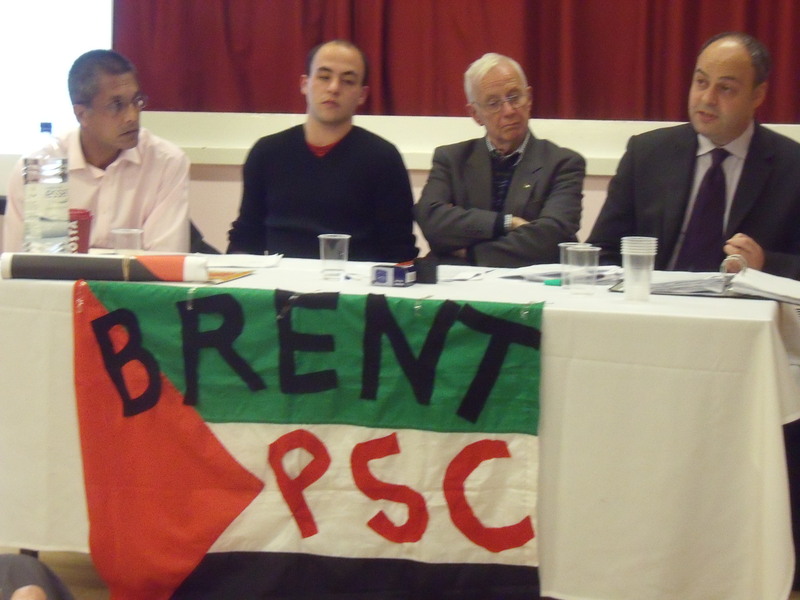 Alam once chaired a Palestine Solidarity Campaign meeting which was so horrific that afterwards one of the audience members let rip with a long Holocaust denial rant. So these are just two of the characters that dominate the Palestine Solidarity Campaign’s activism against Israel. If only the shoppers at John Lewis who heard the accusations of apartheid against Israel and the calls for Israel’s destruction knew these back stories then they might understand what this sort of activism against Israel is truly about. After about 45 minutes the police turned up and the activists removed themselves from John Lewis after being warned by the police that they could otherwise be arrested for aggravated trespass. And as thousands continue to be gassed and murdered in Syria by Assad where are the protests against that and where are Jaciewicz’s articles on Syria? Jaciewicz appears in this clip: blond and in a black top and on her phone. 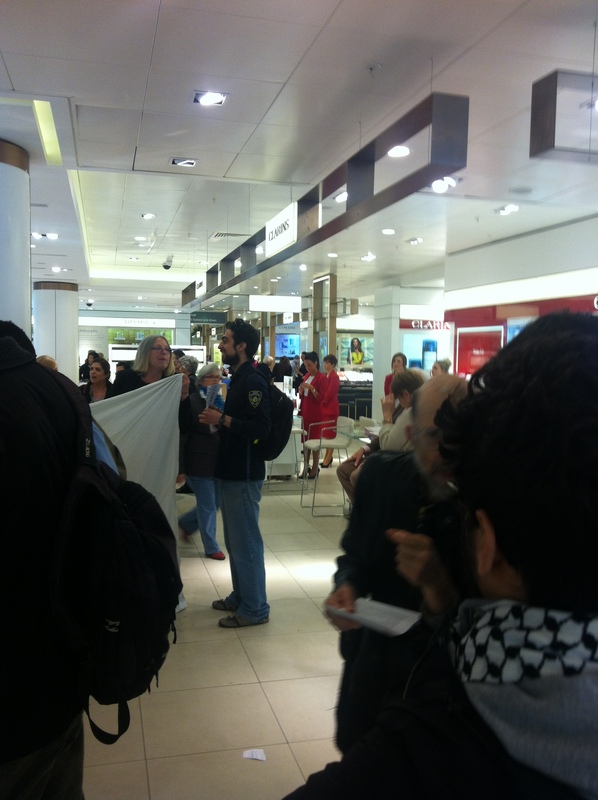 anti-Israel activists inside John Lewis. 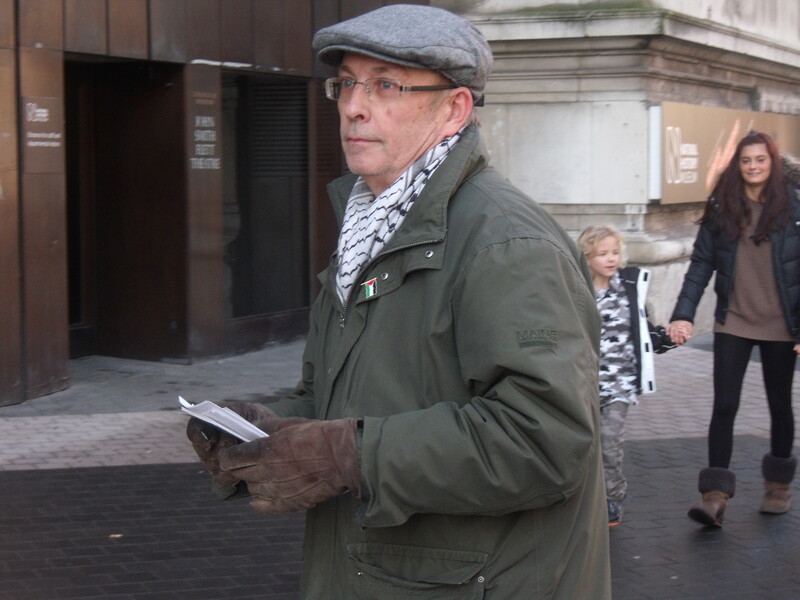 Thanks to Harvey for his footage and photos above and for the others that braved the onslaught on Saturday of this continuous vile campaign against the Jewish state. 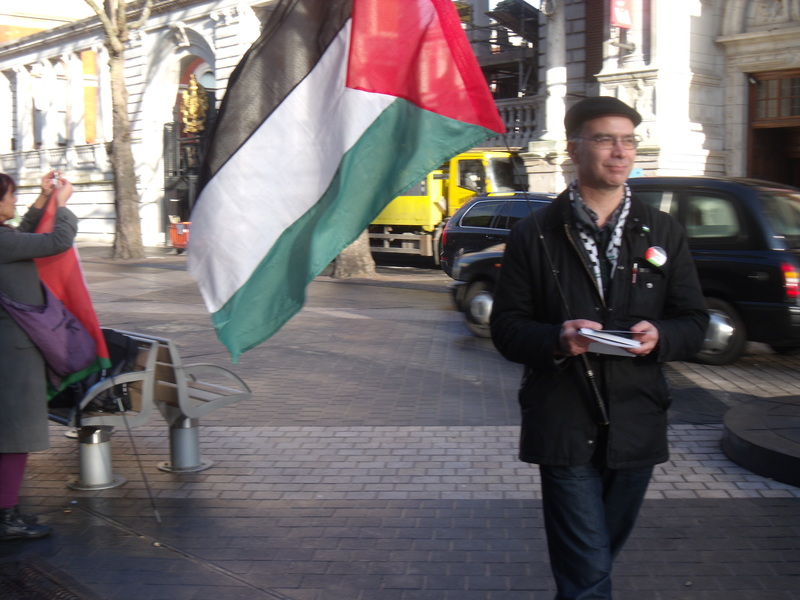 Thank you very much for all the support I received in light of last Monday’s Palestine Society event at SOAS when I was manhandled and told I was a “typical Israeli”, eventhough I am a proud Brit. I received incredible emails from all over the world with people appreciating my attempts to cover anti-Israel meetings in London and appalled by my treatment. I received emails from those who completely disagree with my views on Israel, but were still appalled by the way I was dealt with. And thank you for the Arabic translations too. I never got to the bottom of why I was called a “typical Israeli”. Only that student knows what was in his mind. I had a very constructive chat with SOAS who said they had been inundated with emails from both sides but who wanted to continue to welcome me to SOAS and they said they will be reviewing their filming policy. Much has been made of my not applying for consent to film, but when I was thudded in the shoulder from behind and shouted at to stop filming I wasn’t asked whether I had been granted such permission by SOAS. As it happens I didn’t know there was a filming policy as it has never been mentioned at any SOAS event I have attended (and I have attended a fair few). There was also at least one other person filming who, it seems, didn’t have the required permission either. Meanwhile, I always see students filming on their IPhones. And, unless I nodded off temporarily, none of the required announcements in accordance with the filming policy were made at the start of last Monday’s meeting by the organisers themselves! I believe that in a public space such as a university freedom of speech is commensurate with a right to cover that freedom of speech without fear or hindrance. No one should be disallowed from filming solely because of their political views. I was targeted last Monday night because of my political views. No one else filming would have been roughed up like that. And I have never disrupted an event, despite what is being put about by my detractors. This is reminiscent of another SOAS talk I attended on 16th April about Israel’s Arab minority where I wasn’t even filming. At the talk I was verbally insulted by Gilbert Achcar, a SOAS lecturer, who, after I had asked a perfectly reasonable question during the Q&A, told the room that I was a “professional disruptor”, that had he known I was coming he would have barred me from attending and that I had left insulting remarks on his answering machine. He then told me to get out. Of course I didn’t leave messages on his machine. I wouldn’t even dream of it. Aggressive targeting of those supportive of Israel is not confined to university campuses. 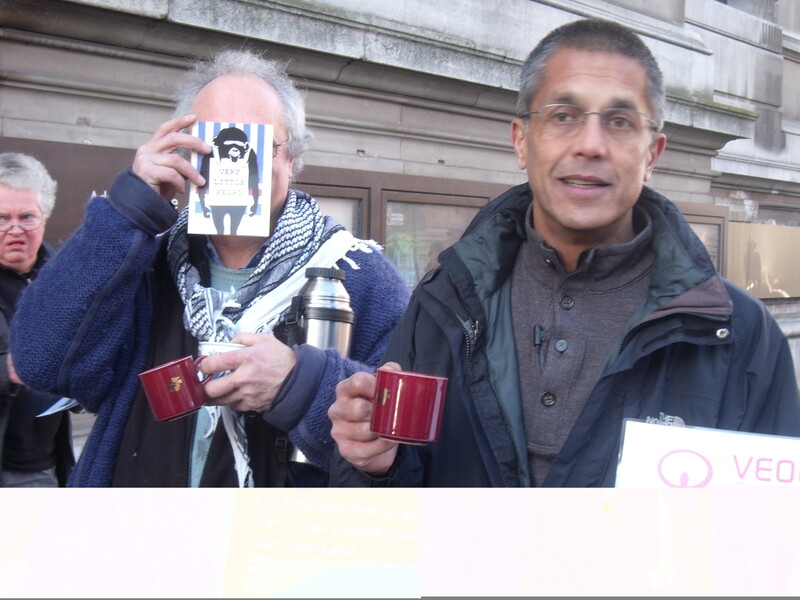 At the beginning of the year I was put through a torrid few months when Peter Scott and Salim Alam of the Palestine Solidarity Campaign tried to have me prosecuted for harassment because of some videos and photos I posted of them demonstrating against Veolia outside the Natural History Museum in December. I was at a reasonable distance while filming their political activism but I ended up being called into Notting Hill Police Station to be questioned about my filming and what I had written on my blog. Scott and Alam seemed to have failed to tell the police that I and others are constantly filmed and photographed for their anti-Israel blog. 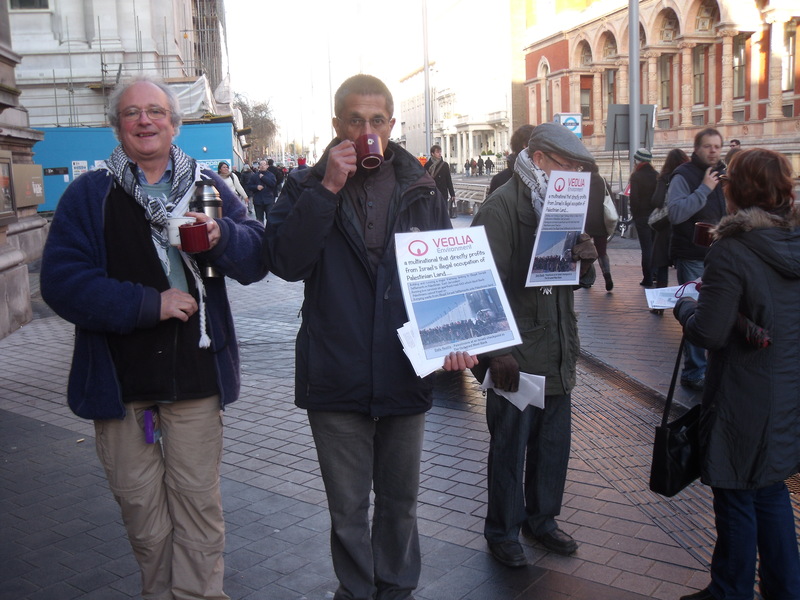 Mulled wine and Israel-hate down at the Natural History Museum. Yasser Arafat would have been proud. With Ahava having closed down those who devote their lives to Israel’s destruction needed somewhere else to vent their hate. Their slime led from Ahava to the Natural History Museum where Veolia is sponsoring an exhibition. 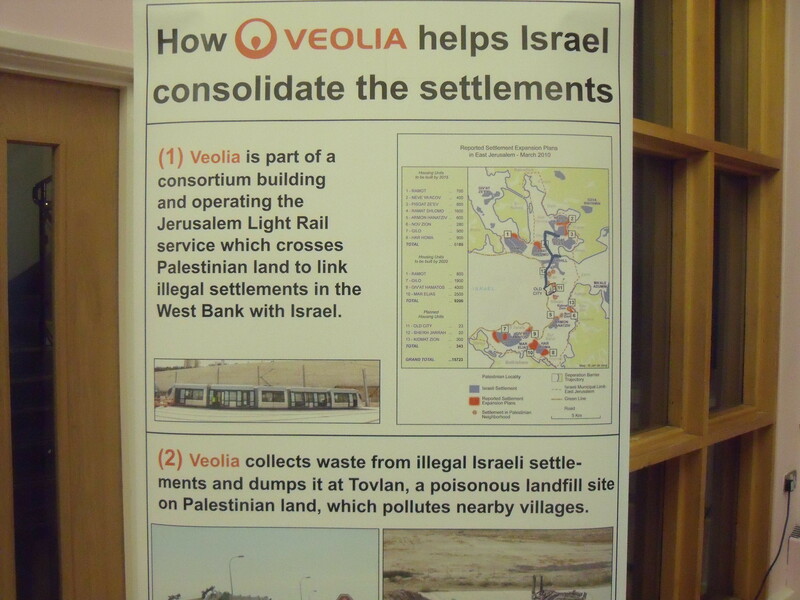 Veolia is helping to build a modern transport network in Jerusalem, which is helping both Israelis and Palestinians to move more easily around the city, but instead the anti-Israel activists fed the usual lies to museum-goers about Veolia being in breach of international law. 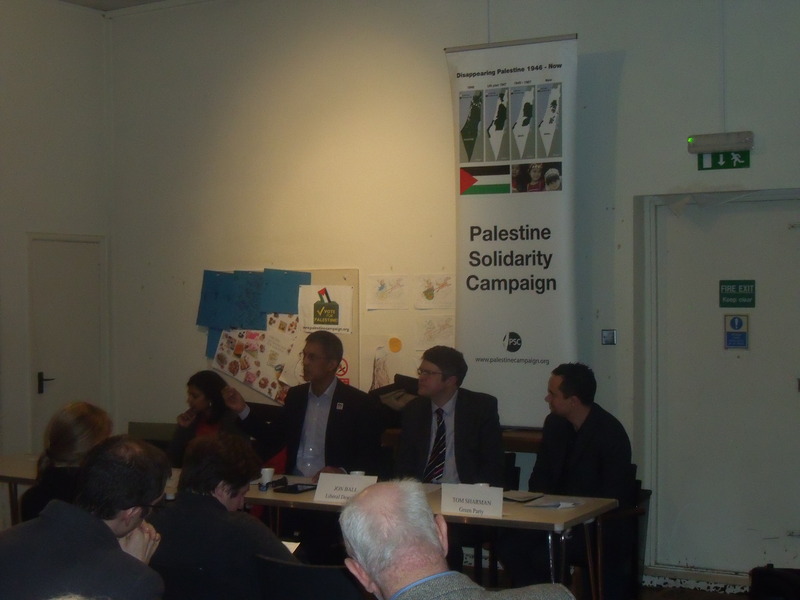 As ever they were led by Salim Alam, who is present at virtually every anti-Israel happening in London these days (in contrast to PSC chief Sarah Colborne who is rarely seen). Did I miss a change in the law to the effect that no one can film political protests now? Have the Taliban taken over? 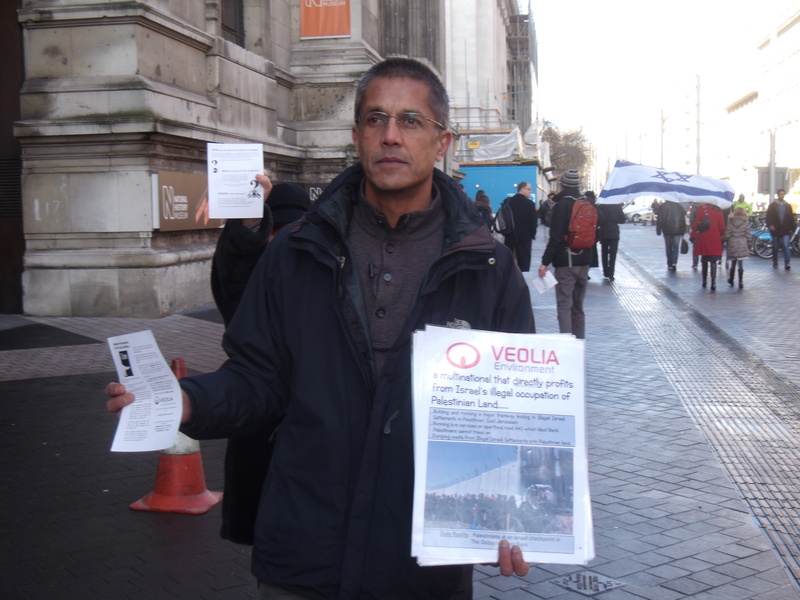 Salim Alam displays anti-Veolia literature (pro-Israel leaflet in background). 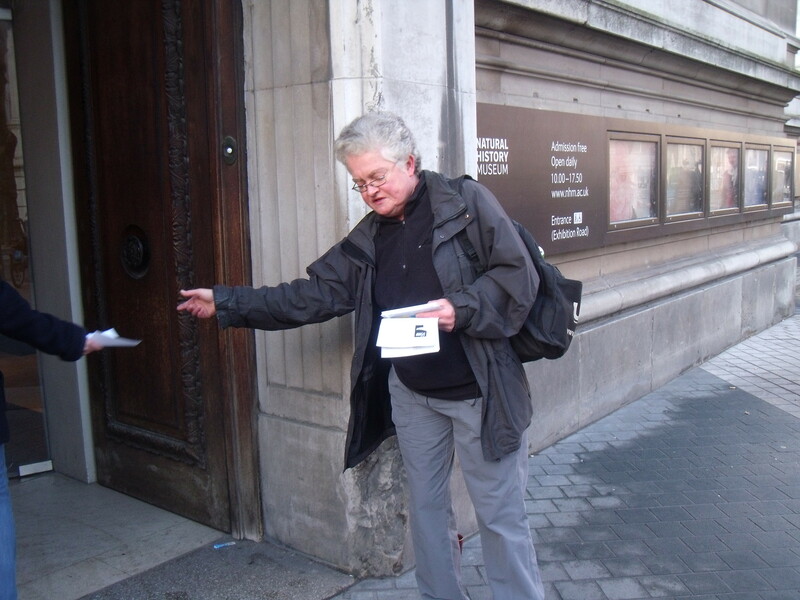 Handing out anti-Israel leaflets at museum door. Drinking mulled wine which they refused to share with us. "Bah, humbug!" The mulled wine begins to take its toll. Showing commitment to the cause: $55 in Vietnam. Nice keffiyeh, shame about the hat. Tuning up for the carols. The singing begins. Don't call us, we'll call you. 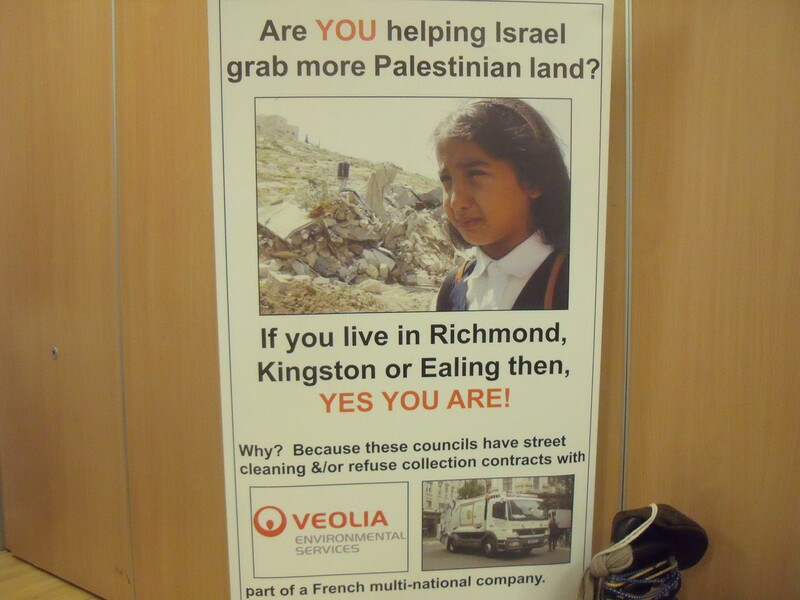 PSC comes to North-West London to try to “dump Veolia”. Salim Alam, Michael Deas, Chair, Simon Natas last night. It was good to catch up with some old faces when I turned up for Brent PSC’s “Dump Veolia” meeting at Willesden library last night. I was sat behind my old friend Abe Hayeem, of Architects for Palestinians, who I once sat down next to at an event when that was the only vacant chair left in the room and he promptly got up as if I was carrying the plague. BDS National Committee, talk but I heard Simon Natas, a London solicitor, give his pick’n’mix interpretation of internation law (see clip below) in which he concluded that “the occupation is seen as being illegal under just about every tenet of international law” before going on to cite the UN Charter, UN Security Council resolutions “ordering Israel to vacate the OPT” and the 2004 ICJ ruling as evidence. This, he suggested, would affect Veolia, especially as it is building the Jerusalem Light Railway which, he argued, will be transferring people into the “illegal territories”. That might be Natas’ opinion, but it can also be argued that “the occupation” is not illegal. The ICJ ruling is non-binding, there are no binding Security Council resolutions that call for Israel to vacate any territory unilaterally and as the UN Charter technically incorporates the Balfour Declaration via the League of Nations’ incorporation of the British Mandate it can, therefore, be argued that Jews can live on the West Bank. 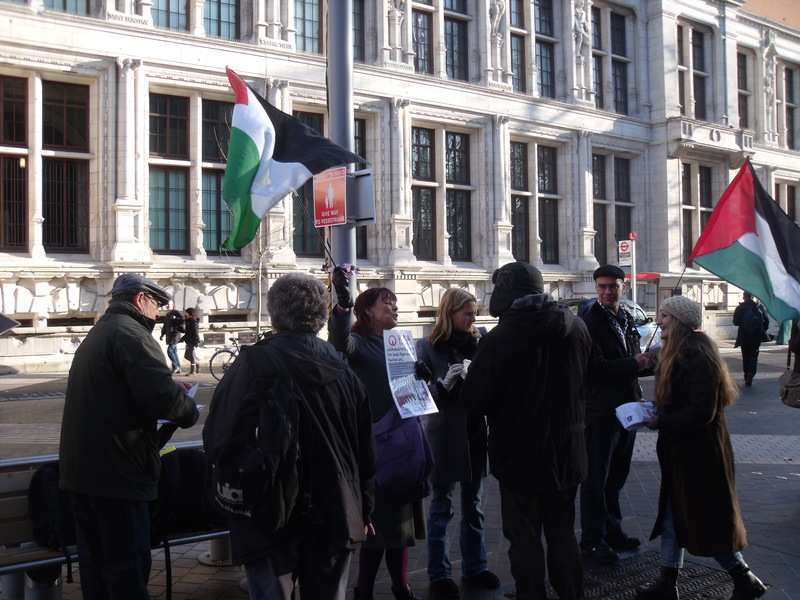 There was also this April’s ruling by a judge in the Ahava trial, where four anti-Israel activists were found guilty of aggravated trespass, that Ahava was “trading lawfully” at the time it was invaded by those activists. I’d go with the objective judgement of District Judge Ian Baker every time over the judgement of the ever so slightly biased Simon Natas in this matter with his membership of Jews for Justice for Palestinians. As ever Hamas and its “let’s kill all the Jews” Charter were not mentioned once throughout his speech, so presumably Hamas is not in breach of international law and so should just be allowed to continue on their killing spree if Israel is ever forced by Natas’ version of international law to take down the Security Wall. Next up was Salim Alam who I have written about on various occasions but without knowing his name, so it was good to, finally, hear him introduced last night. 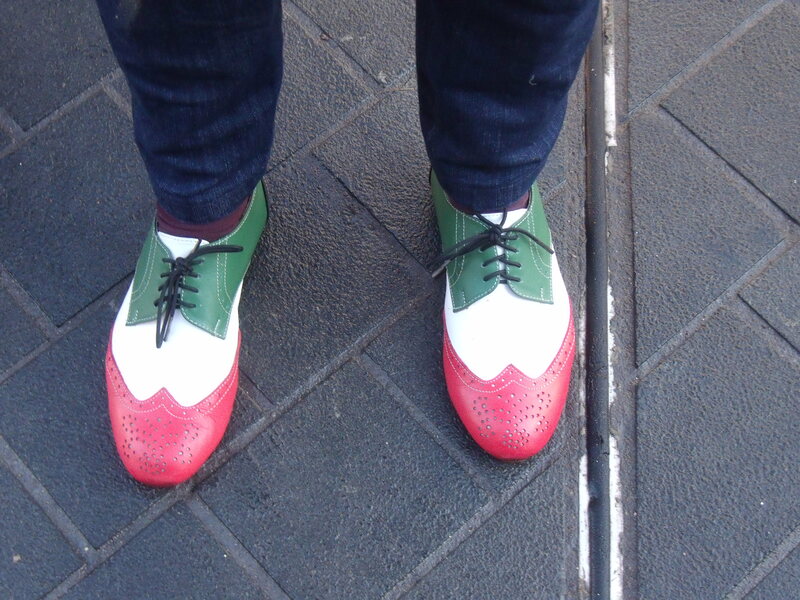 He spends large portions of his spare time hanging around outside supermarkets that stock Israeli produce. That’s when he is not speaking at meetings against Israel. Alam got himself arrested outside Ahava last December when he threatened to knock my camera out of my hand while I was actually filming him. He was released without charge. From what I could guage there have already been some successes against Veolia and Eden Springs. Last night they claimed to have had Eden Springs water stopped from being used in certain offices and universities in the UK and Veolia also seems not to have won contracts with certain councils, although whether the latter was due to pressure on those councils after anti-Israel campaigns is unclear. There was also mention of Israel’s diamond industry. While admitting that Israel only cuts and polishes diamonds, but doesn’t mine them, making it difficult for Israel to be caught by the Kimberley Process Natas argued that a case could be made against Lev Leviev who, according to Natas, invests the proceeds of his diamond polishing company in the settlements. It was mentioned that the strategy of shaming celebrities who are caught wearing Lev Leviev diamonds should continue. It’s funny how people speak of the “Zionist lobby”, because there are many lessons that could be learnt from the well-financed and strongly motivated anti-Zionist lobby.